Mar. 25, 2011 -- Col. Willard Buhl, commanding officer, 5th Marine Regiment, congratulates Sgt. 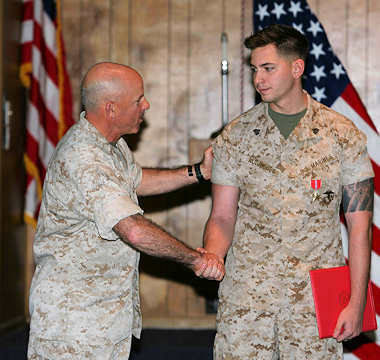 James Rodrigues after awarding him with the Bronze Star for actions under enemy fire in support of Operation Enduring Freedom. Rodrigues a 22 year-old from Modesto, Calif., was part of the Regimental Combat Team 7 partnering team. Rodrigues saved an Afghan girl during a fire-fight with enemy forces on Feb. 22, 2010. Marine Corps Base Camp Pendleton, Calif. (3/30/2011)Sgt. James Rodrigues Jr., a communicator formerly with Regimental Combat Team 7 partnering team, 2d Brigade, 1st Battalion, 203d Afghan National Army, was awarded the Bronze Star with combat distinguishing device at the 62 area chapel, March 25. Rodrigues, 22, from Modesto, Calif., and his team were engaged by enemy forces with small-arms fire from a position to their south on Feb. 22, 2010. The team immediately returned suppressing fire on the enemy position in order to enable others a chance to perform a flanking maneuver. A local family was observing the team's situation before the attack. Once the fire-fight began, the family immediately moved to cover on the side of the road. A small Afghan girl was left standing in the middle of the road. Rodrigues moved to a better firing position after returning fire to the enemy. While taking cover, he observed the girl, crying and frozen with fear. traded by friendly and enemy forces, Rodrigues rushed from his covered position towards the middle of the road. He then grabbed the girl, cradled her in his arms to protect her and carried her to the safety of a compound on the opposite side of the road.